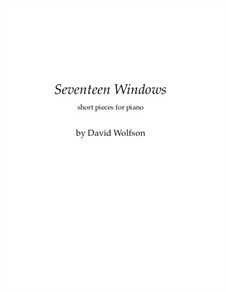 Seventeen short piano pieces, ranging from one to three minutes in length, from moderately easy to moderately difficult. Pianist Martin Perry said of them: "First of all, bravo on your artistry and craftsmanship. The 17 are quite diverse in style and mood. I found them extremely pianistic, and if your goal here is accessibility, they would certainly please a general audience while also satisfying a more serious listener."